Having enjoyed in 1999 a day on Tryfan and the Glyders we all fancied another walk with a bit of "height". We would have loved to pay another visit to Snowdonia but it would have been a very long day for all of us, but especially Mick who is always willing to act as chauffeur. So we decided a trip to Crickhowell and the Black Mountains would be an acceptable alternative. It would also be an hour or so quicker to reach than the mountains of North Wales. So bright and early Mick, Larry, Ray, Peter and I left leafy Warwickshire for the moorland and rocky tops of the Black Mountains. As usual Mick made good time and within 2 hours we had arrived in Crickhowell, parked and were seated in the local bakery/café for pre-walk sustenance, which was very acceptable, and finalised plans for the day. Larry, Peter and Ray had all completed a challenge walk in this area so they were quite knowledgeable of the terrain, so I was hoping for any easy day navigating.Toiling up"Table Mountain". Having returned to the "Mick Mobile" for rucksacks etc. we walked north to the first "hill" called Crug Hywel, which is probably better known as Table Mountain. If anyone has travelled along the A40 between Abergavenny and Crickhowell they are likely to have seen this flat top "mountain" on their right a mile or two before reaching Crickhowell. only a subsidiary top to the main peak of this ridge, Pen Cerrg-calch, which at 2299 feet high is the 6th highest peak in the Black Mountains Range. Although it may not seem that high it certainly made me feel a little breathless by the time I reached the top and rested for mid morning refreshments, water and a Snickers. As we looked south clouds, that had been threatening all morning, moved slowly north-east and we all hoped that they would give us a "wide berth" as we all preferred not to have to use our wet weather gear. Fortunately the clouds seemed to have responded to our pleas and by-passed us as we admired the scenery from the mountain top. The views were superb with the valley of the River Usk to the south and to the east, north and west more valleys with mountains ascending from them. It really was beautiful, if you enjoy such breathtaking views. However, we could not linger here too long. We intended to continue north-west for about ½ a mile before turning north to Pen Alltr-mawr which at 2119 feet high would be the northern most point of our trek. Walking along the eastern side of the ridge between these two high points the good views continued and Larry, Peter and Ray gave Mick and me more details of the Black Mountain Roundabout Challenge Walk. However, in view of the "ups" I’m inclined to pass on this challenge. On reaching Pen Alltr-mawr we lingered awhile taking in the last views from our lofty position before descending south west off the mountain to the next stop, the public house at Cwmdu. However, before getting there we had a very tricky descent with a boulder field across our route. Yet again I was pleased to have the extra stability of the walking poles. Mick and Peter also had theirs and all three of us found it easier than both Ray and Larry who were minus these aids. Because of this we took different routes of the mountain but all met up together about ¼ mile or so from the hostelry where we had lunch. 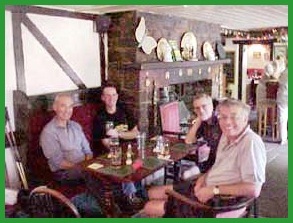 When we arrived at the pub there was only one other customer plus the publican, who acted as both barman and cook. However, he was very efficient and within a very short time not only had we savoured pints of beer but steak and kidney pies with all the trimmings were on plates in front of us; except for Peter who is a vegetarian. However, he was obviously pleased with the quality of the non-meat feast he received. The only problem now, having eaten and supped, was moving from the cosiness of the bar to our next objective, the village of Bwlch located a mile or so away on the A40. The reason for visiting Bwlch was because Larry and Peter had stayed there when they had taken part in the Black Mountain Roundabout Challenge Walk. Besides enjoying the walk they, especially Larry, had enjoyed the two hostelries located in the village, and Larry thought that one of them might be open all afternoon. So without further ado we said farewell to mine host and were soon heading westwards, and a little bit to the south, to Bwlch. Alas, Larry was out of luck. Both pubs were closed. So we headed south along the busy A40 and then the B4560, ‘twas downhill all the way, to the River Usk. 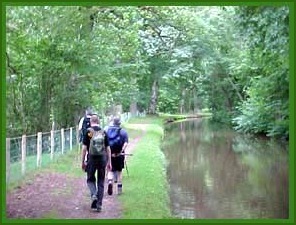 follow this and meet up with the canal a mile or so further on. Unlikely as it may seem I was leading the way on this stretch. As I had my walking poles I was the "stinging nettle chopper downer in chief" which was a very important task as most of us were in shorts. I was merrily chopping down the stinging vegetation when behind I heard a couple of shouts. It seemed my excessive chopping had disturbed the local insect population and in their annoyance had decided to have nibbles at both Ray and Mick. In fact nibble is an understatement. A couple of days later I saw Ray’s wound and, although Larry and I are not medical experts, we thought, from the size and the inflammation, it could have been made by a hornet or a wasp with a very high calibre sting. I still get the blame for disturbing the vegetation. could cause if the canal needed draining, at a number of bridges, where the canal narrowed, there were vertical slots in the banks, opposite to each other, and nearby planks that could be slotted in to make temporary dams if the need arose. Without them it would have been a huge task to empty 10 miles plus of canal if a repair was required, and a huge task to refill afterwards. This part of the walk was a little bit of a route march. Canal towpaths are great for walking fast along and in an hour or so we were back in Crickhowell, and back to the car for our journey home. I estimated, with a little help from the GPS, that we had walked about 17 miles. Needless to say a stop was made on the way home so Larry could replenish his internal liquid levels, which he did without too much encouragement.